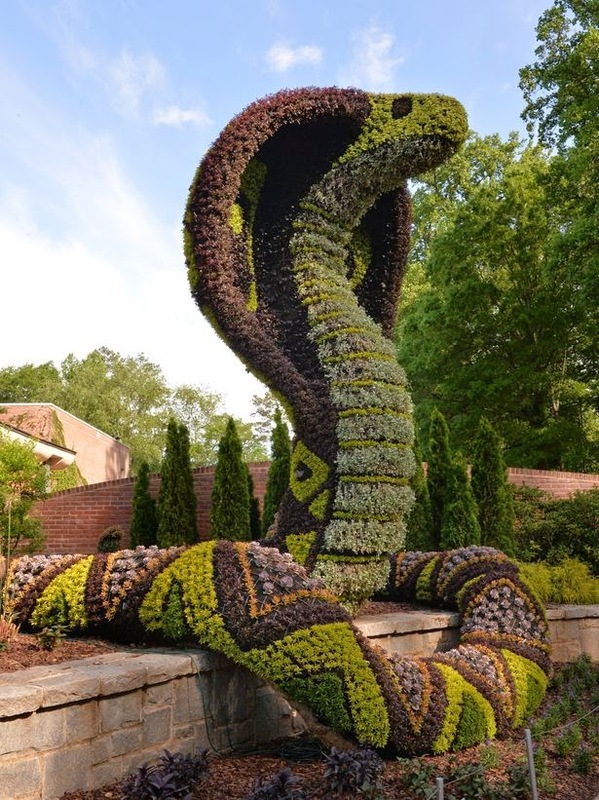 The largest living plant sculpture exhibition ever displayed in the United States has just begun! From now till October 31, visit Atlanta Botanical Garden to see Imaginary Worlds, a New Kingdom of Plant Giants. 28 living sculptures are scattered throughout the garden including nine never-before-seen characters. Brand new this year, you'll find four frolicking frogs, three playful gorillas, and a pair of adorable orangutangs. They join a grazing unicorn, a friendly ogre, gigantic cobras, and beautiful butterflies. The largest sculpture of them all is the 25-foot-tall Earth Goddess which, since last year, has become a permanent part in the Garden's collection. She, alone, is made up of 18,000 annuals.